The Scorpio is a very well equipped car, especially in the Ultima variant. However it was lacking in some areas in comparison to the competition of the time. I decided to add features to the vehicle to further the equipment level. The first project to be considered was automatic operation of the front windscreen wipers. The idea of automatic wipers is not new and various technologies have been used in the past, all with some degree of success. The major technologies are briefly described here. This system uses a sensor that basically consists of two sets of contacts separated by an insulator. When water falls on the sensor, the water conducts a signal that alerts the system to water on the sensor. This system has some fundamental problems, the sensing elements oxidize and become unusable, dirt can foul the sensor and it’s difficult to design a sensor that the wiper can dry completely. 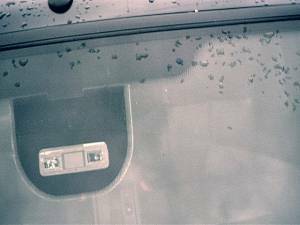 I had considered a sensor of this type in the past, not for windscreens, but to close windows and doors on a vehicle when rain was detected. Capacitive systems utilize capacitive proximity detection techniques. They are reasonably successful, but can be susceptible to stray electrical fields; the electronics tends to be reasonably expensive due to tuning components used in many designs. This type of system uses a piezo crystal element, this can in fact be thought of as a microphone. Rain droplets hitting the windscreen cause sound waves at certain frequencies to be produced and transmitted through and across the windscreen. The Piezo sensor picks these up, electronics then process the signal to try and distinguish between rain and other noises. Again this system is susceptible to false triggering. In current monitoring designs, the wipers actually have to be switched on manually when it rains. 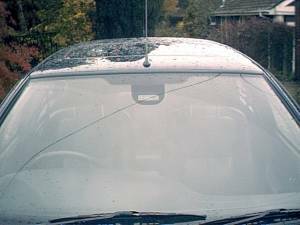 However the current drawn by the wiper motor decreases when the windscreen is wet, as less friction exists between the wiper blades and the glass. The current is monitored and the delay between wipes varied from full on to intermittent. Optical sensors utilise light and the principle of total internal refraction within glass. In its basic form an optical sensor consists of a light source, a light detector and an optical assembly. The optical assembly is two lenses and or light guides. A beam of light is directed through the optical assembly into the windscreen glass, the light is “trapped” within the glass due to total internal refraction. This is the principle used in fibre optic cable. The light bounces from outside surface of the glass back to the inside surface of the glass until it is picked up by the second optical assembly. If rain falls on the glass within the sensing area, light “breaks free” as it is directed into the water droplet, this causes a corresponding reduction in the received light. Usually a microprocessor is used to distinguish between different amounts of rain and runs algorithms to provide best wiping results. It would appear that Optical Sensors are the most popular and reliable method for cost effective detection of rain, they are reliable and maintained free. I considered the current measuring method and optical detection, as the others really did not appear practical for retro fitting, and or just would not be reliable. Current measuring was practical and relatively easy, but wasn’t really the answer as the system would have to be switched on in rain any way. So I decided upon optical detection. Researching optical sensors, I found many, all designed for the Automotive Industry. However most priced over £200. I considered making the sensor myself, but the optical part would be tricky. Then I found a well-specified sensor, which actually came as a kit with all ancillary parts and was very competitively priced. The sensor is manufactured and sold in Malaysia. It can be ordered online by credit card at www.feliogroup.com The cost at the time was US$ 85.00 to UK; this includes FedEx to the UK and works out competitively when converted to Sterling. The sensor referred to as a Rain Sensor, comes packaged with instructions and consists of two main units. The sensor itself that fits to the windscreen internally and a control unit or relay module. Additionally a system on/off switch is supplied and a window tint sheet, similar to the tint around the interior mirror. The instructions provide with the sensor are reasonably concise. 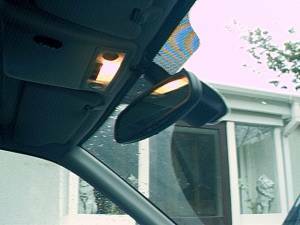 First attach the tinted sheet inside under the interior mirror, ensure the mirror will not foul the sensor when the mirror is adjusted and if fitted the front light sensor on the mirror is not completely obscured. The lens module is then attached, using self-adhesive materials supplied. The sensor is then mounted on to the lens assembly. Ensure all glass is cleaned prior to sticking the tint and lens to the glass. Next run the cable from the sensor along the roof lining and down the pillar. 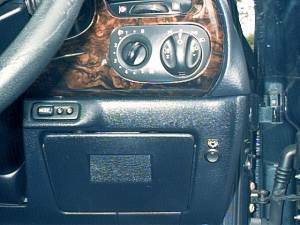 Remove the bottom of the dash to the right of the driver (Right hand drive), this is done by removing the screws on the side and in the change cubby. The wire can be located into this area. I fitted the switch to the dash in this area as shown. It’s a small circular rocker type that looks quit like original equipment. Wires are found, one thicker than the other, I took the supply from here, using a scotch lock. Ensure your wire is rated at least at 20 Amperes. Again feed this wire out of the grommet. I mounted the Relay Module as shown, using the fixing stud as the ground connection. The wiper assembly now has to be removed, this is relatively easy and is described fully in the Air Conditioning Modification on this site. Locating the wiper motor plug on the loom side. 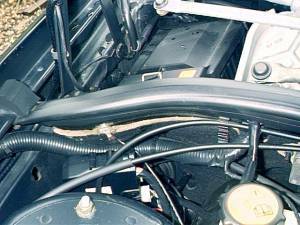 The wiper motor wiring (on 98 24v Ultima) is as follows. Remove the connector to the motor. Cut the two motor wires on the loom White/Green and White/Black. Then connect to the corresponding wires from the Relay Module. Make a connection to the position switch wire Black/Red (I used a splice to join here you could use a scotch lock, beware if you do to ensure its correct size). You are not breaking the connection here, but joining to this cable. Connect the supply and ground as follows. Use insulation tape or self amalgamating tape to loom up all the wiring. On the Relay Module unit ensure Fuse is in +ve position. The fuse in the unit is 20A, , ensure your cable rating is at least as good as this, if not in a fault your cable will melt/burn before the fuse downstream blows. The system is transparent to the factory fitted design. So all the original manual wiper functions can be used, even when the sensor is switched on. When switched on you can see red light from the sensors LED., directing from the sensor. By pouring water onto the windscreen the system can be tested. With a light drizzle the system operates in intermittent mode, with low frequency and slow wiper speed. With normal rainfall, the frequency is medium and the speed low. In heavy rain the frequency is continuous with high-speed wipers on. I find the system very practical and it helps to reduce stress and fatigue on long journeys, when the rain load is varying continually.